In the bowl of a stand mixer, combine milk, sugar and yeast. Whisk until yeast is dissolved and let sit until foamy, about 5 minutes. Whisk in the butter, egg yolks and lemon juice. Add half the flour, cinnamon and nutmeg and mix, using a dough hook attachment, Once ingredients are mixed, add in the rest of the flour in two batches, mixing between additions. Knead by hand or using the dough hook on medium for about 10 minutes, or until dough is smooth and elastic. Once dough is risen, punch down and divide into 3 equal pieces. Roll each piece into a long rope, about 20-24 inches long. Braid the ropes together and form into a circle, pinching the seam closed. Carefully transfer the circle to a baking stone or parchment paper-lined baking sheet. Cover with lightly greased plastic wrap and let rise about 30 minutes. Preheat oven to 375°F. Once cake is risen, bake for about 30 minutes or until golden brown. Remove from oven and transfer carefully to a cooling rack to cool completely. Meanwhile, make the glaze: In a medium bowl, whisk together powdered sugar, lemon juice and water. Divide the glaze into three small mixing bowls. Dye one bowl's glaze yellow, another green and another purple (a combo of red and blue). Once cake is completely cooled, drizzle glaze onto the cake, alternating colors. Sprinkle poppyseeds on top, if desired. Take King Cake baby or a pecan half and tuck into the underside of the cake. Whoever gets the baby in his or her slice has to make the next cake! 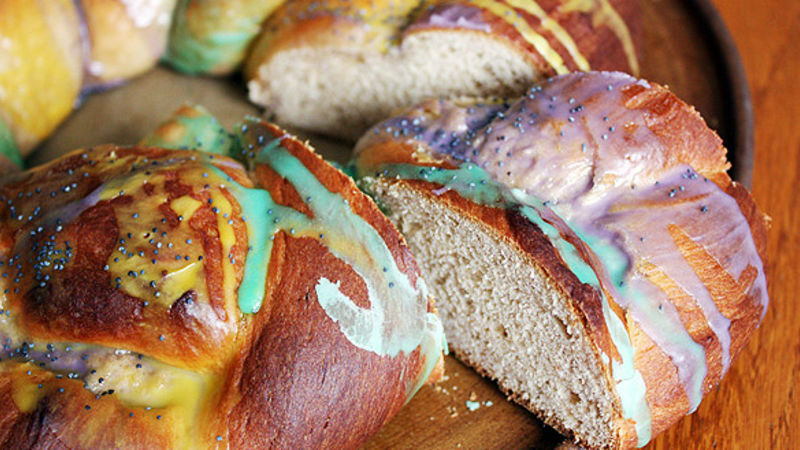 It’s almost time for Mardi Gras – have you made your King Cake yet? If you’re not well-versed in the Mardi Gras tradition (like me, until a few weeks ago), you’re probably thinking, “What the heck is King Cake?” King Cake is a giant ring of twisted, enriched bread (like brioche) covered in a sugary, lemony glaze and tacky Mardi Gras colors (yellow, purple and green). Tradition dictates that whoever finds the King Cake baby (an actual plastic baby or pecan tucked into the underside of the cake) in their slice has to make a King Cake at the next Mardi Gras party. Sounds fun, right? For those who have never even seen a King Cake before, I’ll admit it can be a bit of an eyesore. But knowing it’s for Mardi Gras (an over-the-top celebration in itself) and beneath those crazy colors is a delicious, cinnamon and lemon-flavored cake, I think you’ll decide it’s worth trying at least once. Plus, it’s a welcome change from single-colored, one-flavor cakes. The brightness of the lemon glaze combined with the sweetness of cinnamon and nutmeg speckled throughout the bread-like cake makes this a refreshing (and delicious) recipe. Have fun with it – dye the glaze like I did, or keep it white and sprinkle on purple, green and yellow crystals. Alternate the colors, or make them mingle all over the top of the cake. Poppy seeds are optional too, but I like the crunch and mild flavor they add to the cake. Just remember: Try not to get the baby!